Ever bought a plastic or cheaply made shoe rack, only to have it fall apart not long after? You don’t have to be an expert in construction to make your own design for holding shoes. Below are 4 easy and durable projects that will neatly contain shoes that are so super easy you’ll wonder why you didn’t already think of it. Then you have an instant shoe rack. Painted, decorated or left natural, pallets can hold tons of shoes. 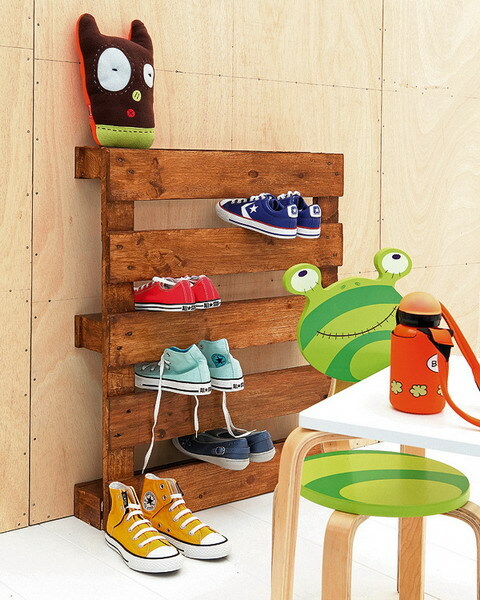 They can be mounted to a wall or stacked and used for nearly any kind of shoe holding shelving. This particular design may scuff the tips of certain shoes, but can easily be fixed by adhering fabric or felt around the boards to prevent toe scratches. Another stress free but smart idea for containing footwear, especially lanky boots, is a sturdy pegboard. These can be kept indoors or out and the pegs can be spaced at various intervals to hold different sizes. Great for getting shoes off the floor, steal this idea from EPBOT. This nifty notion fashions hangers to hold more than clothing. Perfect for lightweight shoes, it is also a great idea for scarves, belts, hats and tons of other objects. Want more of an organization challenge? Try this spinnable idea turned DIY. To make a handmade version of this round shoe cabinet, follow these instructions provided by the Home Depot. It can be customized to hold several pairs, or even built up to make a shoe storage tower capable of holding an entire collection. According to the United States Census Bureau, the National Shoe Retailers Association reported that the U.S. footwear industry brings in around $48 billion per year. That’s a lot of shoes, so if you have a pile of them lying around it’s a good thing there are tons of inexpensive ideas for storing them.